The Bowed Piano Ensemble, founded by Stephen Scott at Colorado College in 1977, has evolved into a small orchestra whose ten players conjure, from one open grand piano, long, singing lines, sustained drones, chugging accordion-like figures, crisp staccato tones reminiscent of clarinets, deep drum tones and more, often simultaneously, to create a rich, contrapuntal new-chamber-music tapestry. The Ensemble has made nine European tours and three to Australia. We have performed at world-renowned venues such as the Sydney Opera House, Jazz at Lincoln Center, Town Hall, Palais des Beaux Arts in Brussels, the medieval Town Hall in Tallinn, Estonia and Jameos del Agua, a volcanic lava-tube-become-concert-hall in Lanzarote, Canary Islands. The Ensemble has performed commissioned works with the Los Angeles Chamber Orchestra, Pacific Symphony, New York Philharmonic English horn soloist Thomas Stacy and the London ensemble Piano Circus. Our six recordings (three with soprano Victoria Hansen) are on the New Albion, Albany and Navona labels. After 37 years based at Colorado College, The Bowed Piano Ensemble has ended its academic affiliation. We intend to find a new home for the bowed piano and its legacy. “Few composers achieve true originality in their palette. Occasionally a composer comes along who finds his territory and explores every nook and cranny within it, luxuriating in its richness. Stephen Scott’s brilliant forays into the interior of the piano must be included with the prepared piano work of John Cage (and) the player piano machinations of Conlon Nancarrow as examples of startlingly unique artistic vision. The instrument speaks in a new but strangely familiar voice, as harps, mandolins and orchestral strings seem to emerge. Scott has found his own orchestra in there” (Ingram Marshall). Stephen Scott was born in Corvallis, Oregon in 1944 to parents trained in the sciences; early study of music included tutoring in recorder in England, clarinet and saxophone in school bands, and private study and transcription of recordings by Charlie Parker, Miles Davis, Thelonious Monk, Gil Evans, Oliver Nelson and John Coltrane in high school. After studying composition with Homer Keller at the University of Oregon and Gerald Shapiro at Brown, he met and studied informally with Steve Reich in Ghana. Later he collaborated with Terry Riley, and these two composers became his most important influences outside jazz. Scott is a Emeritus Professor of Music at Colorado College. He has served on the faculty of The Evergreen State College and as visiting composer at Eastman School of Music, Aspen Music School, New England Conservatory, Princeton University, University of Southern California, Cal Arts, and at festivals and conservatories in Germany, France, Italy, Estonia, Bulgaria, Lithuania, Ireland, Norway, England, Canary Islands, Bermuda, New Zealand and Australia. He was named 2008 USA Simon Fellow by United States Artists, and in 2004 he was a resident scholar at the Rockefeller Foundation’s Bellagio Study and Conference Center on Lake Como, Italy. Scott is listed in New Grove’s Dictionary of American Music and Baker’s Biographical Dictionary of Musicians, and his work is discussed in several books on twentieth-century music. Awards include commissions from Meet the Composer/USA, Pacific Symphony and the Barlow Endowment, a grant from the Peter S. Reed Foundation, the New England Conservatory/Rockefeller Foundation Chamber Music Prize, and a National Endowment for the Arts Composer’s Fellowship. His music may be heard on the New Albion, Navona and Albany labels. Film and television credits include Traffic (DVD version), Egg: the Arts Show (PBS) and the NBC special Revenge of the Whale. Scott lives in Colorado Springs with his wife, Victoria Hansen, who tours with the Bowed Piano Ensemble as soprano soloist. Few chamber groups deploy their musicians as oddly as the Bowed Piano Ensemble. 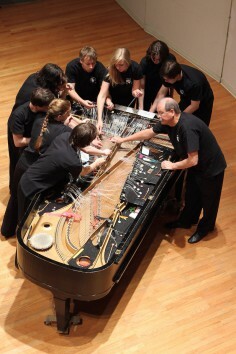 The 10 players, students led by the composer Stephen Scott, stand around, and sometimes under, a concert grand, armed with items of all kinds — nylon fishing line, piano hammers, guitar picks, strips of paper, rolls of plumber’s tape — and reach into the instrument to draw sounds from its strings. The music is tactile and otherworldly, sometimes percussive and often lyrical. Mr. Scott formed the ensemble in 1977 as an outgrowth of a new-music group he directed at Colorado College in Colorado Springs, where he has taught since 1969. He has written prolifically for the group, which has released albums of his music on the New Albion and Albany labels, with a new installment, “Ice & Fire,” due next month on Navona. He will, he added, continue to compose, probably for more standard forces. He already has an opera in the works. And perhaps with his post-retirement career in mind, Mr. Scott has expanded his scoring slightly over the last decade. “Afternoon of a Fire,” which opens the new CD, commemorates the 2012 Waldo Canyon fire near Colorado Springs and uses American Indian flutes. And his program on Saturday includes music from two song cycles, “Paisajes Audibles” (2002) and “The Deep Spaces” (2005), with the soprano Victoria Hansen, his wife, as the soloist, as well as “Lyric Suite” (2011), which has a solo line for Thomas Stacy, the former English hornist for the New York Philharmonic. Mr. Scott did not invent the idea of playing the piano by manipulating the strings directly — as opposed to using the keyboard — or by otherwise tampering with the instrument’s innards. Early in the 20th century, composers like Erik Satie, in “Piège de Méduse,” and Heitor Villa-Lobos, in “Chôros No. 8,” instructed pianists to weave paper between the piano’s strings. And John Cage began writing for what he called a “prepared piano” — with pieces of metal, plastic and other materials inserted into the instrument’s mechanism — in the 1930s. Composers since then have regularly asked players to reach into the piano to strum, pluck or strike the strings. But most composers who have tinkered inside the box have expected pianists mainly to use the keyboard to produce their sounds. What sets Mr. Scott apart is that his music, composed over several decades, ignores the 88 keys. His players go directly for the piano’s guts, and listening to his music without seeing the ensemble, you would not guess that it was produced on a piano — or, for that matter, on any conventional instrument. Mr. Scott writes in an accessible post-Minimalist style that has evolved considerably since the early 1980s, when his first recorded pieces used chugging, repeating figures that show Steve Reich’s influence, as well as droning, sometimes harmonically dense organlike sounds. He took a while to find a style that suited him. As a student, first as a boy in his native Corvallis, Ore., and then at the University of Oregon and Brown University, he played clarinet and saxophone, and his heroes were jazz musicians — Charlie Parker, Miles Davis, Thelonious Monk, Gil Evans, Oliver Nelson and John Coltrane are the ones he readily names. In 1970 he went to Ghana to study polyrhythmic drumming, and met Mr. Reich, who was there to do the same. Mr. Scott studied drumming in other African countries as well, and when he returned to Colorado, where he had just started teaching, he fell under the spell of Mr. Reich’s and Terry Riley’s Minimalist ensemble works. “I was searching for my voice, as most composers do at some point,” Mr. Scott said in a Skype interview from his office in Colorado Springs. “You can write 12-tone pieces and sound like 200 other composers, and I was engaged in that for a while, as a lot of us were. “But I became interested in a trend, in those days, of writing for masses of similar instruments — 40 flutes, or dozens of tubas. I was intrigued by that, but I didn’t want to duplicate what other composers were doing. And it occurred to me that using a piano, I could create an ensemble that was homogeneous and heterogeneous at the same time.” As the director of a new-music ensemble at the college, he had no trouble finding students eager to experiment. They began by making simple tools like nylon filament, which when pulled across the piano’s strings acts in much the same way a bow does on a stringed instrument. Popsicle sticks with horsehair attached are used similarly but draw a different kind of sound. From there, the arsenal grew. All of the tools the group uses are handmade, and when Mr. Scott is invited to perform one of his works at another college, he insists that the students there make their bows, hammers and other devices too. To make it (relatively) easy for the players to find the right notes inside the piano, the strings are color coded according to pitch. Né en 1944 dans l’Orégon, Stephen Scott suit une éducation musicale sous le signe de l’ouverture : clarinette et saxophone pour commencer, transcription d’enregistrements de Charlie Parker, Miles Davis ou Gil Evans ensuite, et pour finir une solide formation académique de composition, complétée par des études de musiques africaines au Ghana, en Tanzanie et au Zimbabwe en 1970. C’est en 1977 qu’il crée le Bowed Piano Ensemble : dix interprètes tirent de l’intérieur d’un seul grand piano un orchestre riche en couleurs et en textures. Ils utilisent des filaments de nylon, des crins, des marteaux de piano tenus à la main, des grattoirs de guitare et d’autres moyens encore pour que les entrailles du piano livrent tout un monde inconnu, dans la lignée du piano préparé mis au point par John Cage dans les années 40. Plusieurs disques retracent le développement de cet ensemble. En 1996, Vikings of the Sunrise montre déjà l’ampleur du parcours, sa richesse. L’oeuvre, de près d’une heure, est un hymne aux navigateurs ayant exploré le Pacifique, depuis des temps reculés jusqu’à Magellan et James Cook. Un souffle épique parcourt cette vaste fresque d’une incroyable variété sonore et rythmique : harpes, mandolines, cordes et percussions jaillissent comme des eaux primordiales, inouïes. Arcs-en-ciel frottés d’étincelles, grandes vagues frangées de cuivre et d’or, tempêtes fastueuses agitent le Stephen-Scott-Vikings-of-the-Sunrise.jpgpiano frappé, pincé, caressé par des archets soyeux ou métalliques jusqu’à ce qu’il rende l’âme qu’il gardait secrète derrière sa double rangée de touches blanches et noires…Il ne lui manquait plus que la voix . C’est chose faite depuis la parution en janvier 2007 de The Deep Spaces. La soprano Victoria Hansen, qui a déjà tourné avec l’ensemble, y interprète une série de textes célébrant les beautés du lac de Côme. Après un préliminaire de piano-orchestral, le disque s’ouvre par un fragment de lettre de Pline, se poursuit avec des poèmes de Wordsworth, Byron, un autre fragment de lettre dû à Mary Shelley, pour se terminer sur un poème contemporain de Pablo Medina, poète et romancier cubain. Nourrie de réminiscences de Liszt et Berlioz, la musique est plus charmeuse, d’une rondeur épanouïe. On n’en reste pas moins stupéfait de la largeur de palette de l’Ensemble, manifestement de plus en plus à l’aise. Stephen Scott est un maître peintre-musicien, paysagiste subtil et inspiré : un inventeur de beautés vierges.